You Can Make A Difference In A Student's Life! 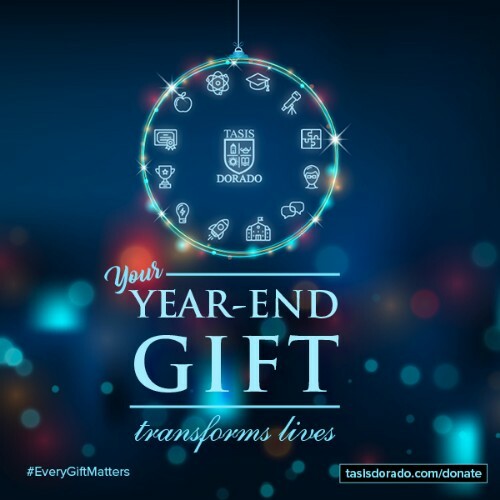 GIVE A GIFT THAT TRANSFORMS LIVES - A TASIS DORADO EDUCATION. This school year, TASIS Dorado has awarded $328K in scholarships and financial aid. So far, we have raised over $65K in donations. We invite you to make a year-end, tax-deductible gift to support our mission to transform lives. Thank you! TASIS Dorado is a registered 501(c)(3) non-profit institution under the U.S. and Puerto Rico tax codes. By phone: You may call us at (787) 796-0440 Ext. 262 with your credit card information and we will be happy to process your gift. By check: You may mail your check to TASIS Dorado Business Office, 11 Carr. 693, Dorado, PR 00646. Please indicate the purpose of your donation in the memo line. By Credit Card: To make a donation online, please click the button.